You need to manage these accounts on all servers separately, making enforcing of password policies and such difficult. If you need your build agent to do stuff (like copying files, creating websites, etc) on servers in the target domain, you’ll probably want to run the agent as a domain account, so that you can easily authenticate on your target servers. 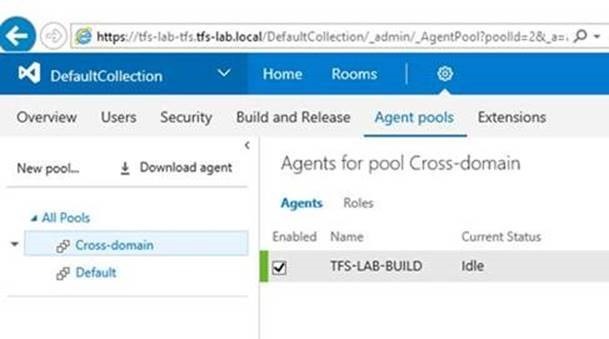 Unfortunately, before TFS 2017 it was not possible to run your build agent under a domain account, and authenticate to a TFS server running in a different, untrusted, domain. This is a fairly common scenario, and there wasn’t a really good solution. Until now! With TFS 2017, Microsoft has made it possible to use Personal Access Tokens (PAT) for on-premise deployments (VSTS has had this concept for quite a while already). In order for this to work, you’ll need to run your TFS server on HTTPS. Fortunately the TFS 2017 configuration wizard lets you easily configure this. Make sure that you’re using a SSL certificate that’s trusted on the build agents as well as on all clients, or you’ll be treated to some nasty certificate errors. Copy / paste the generated PAT and store it somewhere safe (like in a password safe). If you lose it, there is no way to retrieve it. You’ll have to generate a new one. By the way: this PAT is only needed when registering a new build agent to TFS. Once the build agent is up and running, you don’t need the PAT anymore, and you could even revoke it. Server URL: the URL to the root of your TFS server, so without the “/DefaultCollection” bit. Remember, this needs to be a HTTPS URL. User account to use for the service: enter an account in the domain where the agent will be running. There you have it! I hope this helps! Hi, thank you for this post, i have question. what if we have artifacts in one domain (artifact server resides in test domain), and production domain need to fetch them, in this scenario we have agents in 2 domains but agent in production domain can not copy artifacts from UNC in test domain. What is your opinion on this issue. in this scenario I would choose “Server” for artifact type, instead of an UNC share. That way the artifacts are stored in the TFS database, and the agents will have no problem retrieving them from another domain. See https://www.visualstudio.com/en-us/docs/build/concepts/definitions/build/artifacts for more info.